Next week, countries will gather in Katowice, Poland, for the latest round of UN climate negotiations – the so-called COP24. Their plan is to try to agree on how to implement the 2015 Paris Agreement. However, the Polish government has invited coal and gas companies to sponsor the talks, giving these dirty energy companies a platform to greenwash and lobby for false solutions. It will be the third time that Poland, a country heavily reliant on coal, will host the UN climate talks. Thir year it’s already the 24th Conference of the Parties under the UN Framework Convention on Climate Change – COP24 – that will be taking place in Katowice. The last time the Polish Government presided over the talks, the conference was also brimming with sponsors from the coal and gas industries. If this COP is a repeat of the one Poland hosted in 2013 (COP19), this bodes ill for the climate. 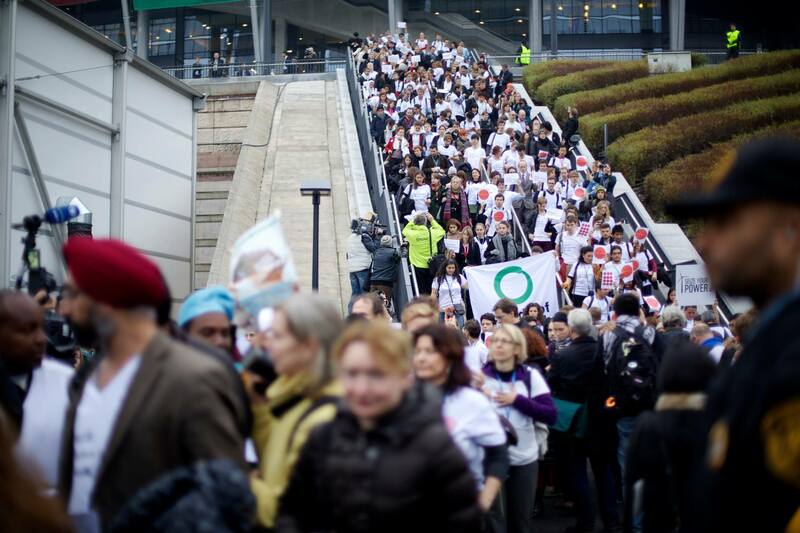 So extreme was the corporate capture of COP19, over 800 members of civil society walked out of the talks on the penultimate day, chanting “Polluters Talk, We Walk”. Some of the biggest climate culprits had their logos plastered across the conference venue, advertising their climate credentials with little reflection of the reality of their business models. Culprits included steel giant ArcelorMittal, which made billions of profits on the EU carbon market while causing havoc in communities around the world; BMW, which had been lobbying hard against CO2 emissions reductions for cars; Polish oil company Lotos, which had been pushing for fracking, and other big polluters such as Emirates, Opel, and PGE – the largest, state-owned Polish power company and biggest developer of coal power plants in the EU. But the event that caused most outrage was the International Coal and Climate Summit, celebrated as an official event in the middle of the talks, which had been organised by trade association and lobby group the World Coal Association along with the Polish Ministry of Economy, and was addressed by UNFCCC executive secretary Christiana Figueres. Despite coal’s status as the dirtiest fossil fuel, leaving it no place in any scenario for a safe climate, Poland’s government co-signed the industry’s plea to the UN to embrace coal as a solution. Just as in 2013, fossil fuels look set to take centre stage at COP24. This year’s talks take place in Katowice, a staunch coal-mining region. A government-backed trade union conference this summer made clear its position that the coal industry should be supported and coal treated like all other “energy carriers”, adding that countries should be free to burn their own domestic energy sources (ie coal). In its public relations efforts, the Polish Government is pushing the story of a successful transition away from coal, in particularly the town of Katowice itself. But Poland still gets 81 per cent of its electricity from coal. The first official sponsor to that was announced for this year’s edition of the UN climate negotiations also happens to be a coal company. 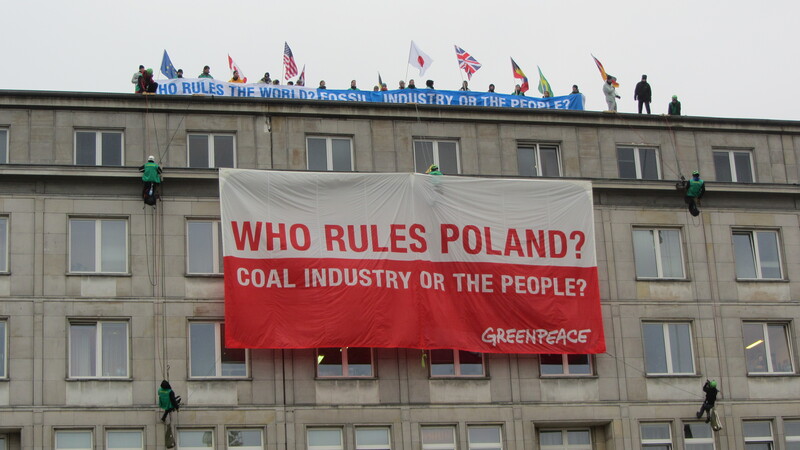 And while Poland appears to be taking a less confrontational approach – with no International Coal and Climate Summit scheduled so far – the push for coal is still very evident. Anticipating another coal-coopted COP, Greenpeace have just climbed the cooling tower of the Bełchatów coal plantto demand a move away from coal and a just energy transition. Few snippets of that ‘business day’ have been reported on the UNFCCC and COP24 websites, and have neither lessened concerns that the meeting was just another case of privileged access to decision-makers for business, nor that the UNFCCC may endorse weak action by big polluters. The Deputy Executive Secretary of UN Climate Change, Ovais Sarmad, told the corporations at the meeting: “You have all highlighted that economic growth and tackling climate change are compatible. In fact, one leads to the other. Therefore, it is a very encouraging moment. We need to have a just transition to low-carbon.” COP24 President Michal Kurtyka warned against making “requirements unreasonable or too far-reaching” for business – despite the existence of strong scientific evidence that a far-reaching transformation of our energy systems and economies is inevitable to prevent catastrophic global warming. Sarmad and Kurtyka’s words are a slap in the face. PGE Group (Polska Grupa Energetyczna) is the largest state-owned Polish power company and the biggest coal-fired power plant developer in the EU. Among its power plants is the infamous Bełchatów coal (lignite-fired) plant in Poland, the biggest installation under the European Trading System (ETS, Europe’s carbon market), the second largest fossil-fuel power station in the world, and biggest polluter in Europe. Belchatów is a source of considerable health and environmental problems including air and water pollution, contamination of soil, and an immense contribution to respiratory and other health impacts and a lower standard of living. PGNiG is a gas giant who has very actively pushed for fracking and is renowned for using ‘astro-turf’ (ie false grassroots) campaigns to give shale gas the appearance of public support. Increased gas use is one of the recurrent false solutions promoted by business to tackle climate change. However, gas is just another fossil fuel and burning it accelerates global warming. While the gas industry promotes it as a green solution, what it desperately wants you to ignore is that so-called ‘natural gas’ is primarily made of methane, which is a greenhouse gas over 100 times worse for global warming than CO2 over a ten year period. During extraction and transportation large quantities of methane escape into the atmosphere, meaning that over its entire production cycle, natural gas can have an even bigger footprint than coal – particularly if it is produced using fracking. In addition, the extraction and transportation of gas destroys communities and their environments in the global South but also in Europe. Worryingly, policy-makers are buying into the lavish industry campaigns falsely promoting gas as a ‘transition’ energy (and more recently as ‘renewable’) and are increasingly supporting gas use and infrastructures in their policies. The European Commission’s open arms for the gas industry will be on show at the 12 December event in the EU Pavilion in Katowice, co-organised by the Commission and GasNaturally, a powerful gas lobby group made of six trade associations spanning the supply chain. The Polish government inviting this oil and gas club to sponsor COP24 will give these industries airspace and, most likely, privileged access to the talks – at a time when the stakes could not be higher! While the Poland-hosted COP24 seems to be going in exactly the wrong direction, the People’s Demands for COP24 are calling for real solutions: keeping fossil fuels in the ground and ending the corporate capture of the climate talks. Whether it is NGOs closely following the talks or grassroots movements increasing the pressure on their governments at home, civil society is working hard to stop the Polish government and its dirty energy sponsors from wrecking the UN talks – and our climate.